This has been a year of very good and very sad times. 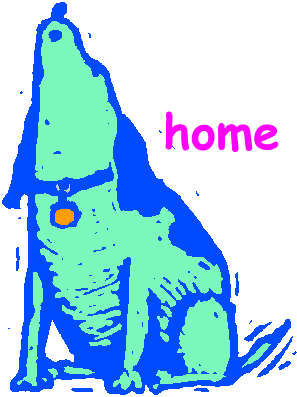 On June 27, I lost my greyhound, Wylie, to hemangiosarcoma. It was the most difficult loss I've ever experienced. It will take some time, but hopefully at some point I will be able to see the good from this experience. Wylie fought the cancer very bravely, but in the end, it was just too much for him. I had to make the painful decision to end his suffering. He let me know as clearly as he could that it was time. Thank you so much to Dr. Sara Salmon at VETS, for ALWAYS being there for us. Especially for being there at the end. You are an angel. Thank you also to Dr. John Gruss and the wonderful staff at Earlysville Animal Hospital, for doing day care for Wylie when I had to go to work. I surely would have lost my job with out you! The day after Wylie died, I got a call from the family who had adopted Willow. 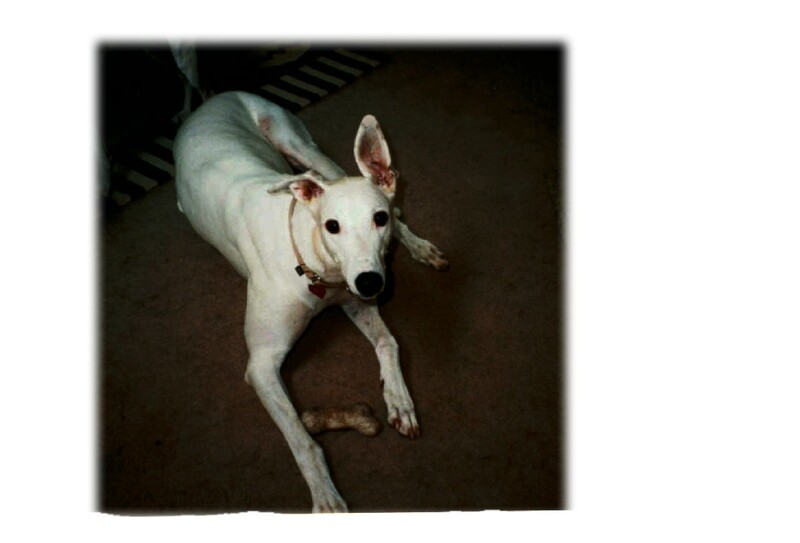 Willow is a beautiful whippet who I had especially bonded to when she was here. I hated parting with her, but thought I was doing the best thing by letting her go to a new family. Evidently Willow had other ideas, because she turned into the dog from hell at her new home, and they decided to bring her back. I've never been happier about a failed adoption! Willow is now "Wyllow," in honor of Wylie. She is comfortably streched out on the sofa at this moment, a nearly perfect angel now that she's home. Having her come home was a bright spot in a very sad time. I'm sure Wylie had something to do with the timing. He was just that kind of dog. Ready to go back to the top? We very tragically lost Fred last month, and miss him so very much. In spite of all our efforts to keep our animal companions safe, healthy and happy, sometimes events are beyond our control. In the space of a half an hour when I had gone to do some pet sitting, Fred dug out of his pen one sunny Saturday morning and got into a fight with three other snips dogs. He was pretty badly torn up, but I got him to the vet and really thought he was going to be just fine. He came out of his surgery with no problems, but his condition became serious later that evening, and he died during the night. Fred evidently had some health problem that the trauma of the attack caused toflare up. Things will never be the same around here without my little red Fred. 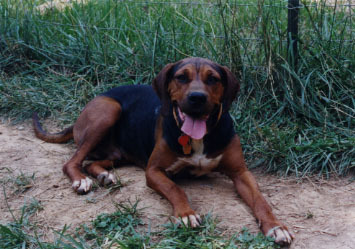 Fred was a black and tan coonhound cross, about four years old and a solid 60 pounds. He was very loving, but a little shy probably due to some abuse early in his life. Fred was a great guy, but he had his quirks! He could raise a real racket, and he LOVED to dig. He'd done major excavation around snips. Nobody will ever dig a hole around here without it making me remember Fred. See you at the bridge, sweetheart! Our thanks to Dr. Janet and the staff at Rukersville Veterinary Clinic for their wonderful care. We've done some adoption outings at Whole Foods, with great success! Several dogs and cats whose photos hadn't even made it to the webpage are now in wonderful new homes. It's hard to see them go, but wonderful to know that they're going to homes where they will receive the love and attention that they deserve. Our love to Jasper, Marmelade, and Kringle and their new families. May they all have long, happy, healthy lives!!! Several people have met Wylie, Zack and Trigger, the snips greyhound spokesdogs, and we hope to be placing lots of greyhounds in the near future, too! Many many thanks to Judy Levine, Gary Lisle, Trigger and little JRT sister Lizzie for all their help! Also, thanks to everyone who has called snips for petsitting. You are helping to keep snips and me going, both financially and emotionally! Had a great visit with one of our "Happily Ever Afters" this weekend! Mia was adopted out a littleover a year ago, and it was amazing to see how has grown into an absolutely beautiful young lady. She is TOTALLY in love with her human family. I don't think she ever remembered me - or she was afraid I had come to take her back! - but it was still so heartwarming to see how well she's done. Sadie, who had been here at snips for almost three years, went to her new home this past week. As much as I love her, I always knew that Sadie would do much better in a home where she didn't have so much competition for her human's affection. She has found a wonderful family, and will finally have the life she's always wanted. 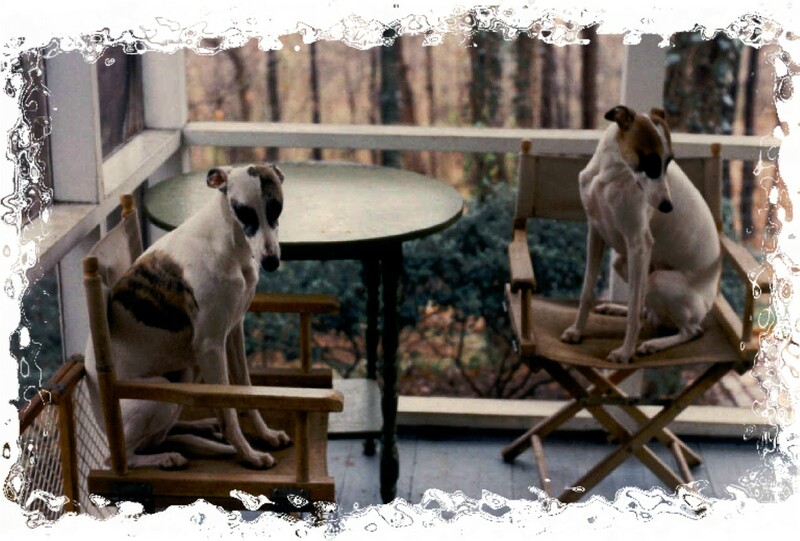 Very sad news is the passing of snips Whippet Grande dame, Kimberwicke O'Connor, known as Flannery. 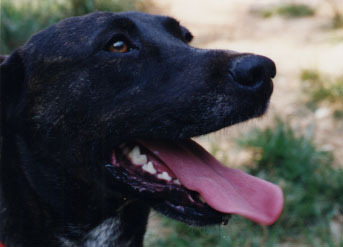 Flannery was the last of five wonderful dogs from the only litter I have ever bred. Her passing marks the end of an era for me and my family. Flannery was a very good show dog in her youth, with points toward her AKC championship. Her beauty lasted into old age, and she died a day short of her 14 1/2 birthday, a fighter with a heart like no other dog I have ever known. Dr. Beverly Young at Madison Companion Animal Hospital helped ease Flannery's passing, and I will be forever indebted to her for the incredible compassion and understanding she showed both Flannie and I.
Flannie girl, thank you for hanging on through some really tough times, kiddo.You fought as long as you could to keep from leaving me, and would never have given up. Your passing was one of the sweetest, purest moments of my life. Thank you for making sure I knew it was the right thing to do. Gulliver has been waiting a long time to be with you again, so fly off to meet him, my little angel. Tell your sweetest momma, Bonnie Belle, that she made the most amazing babies, and that I still think of her every day. Miss Patriot isn't far behind, so make sure she knows the way. Amanda has named the bunny "Nibbles,"and we're sure they'll be good friends for a very long time. September 16, 2000 ~ Frisbee Competition at the Plow and Hearth Country Store in Madison, Virginia The competition was wonderful. The weather was superb. And again, the greyhounds made lots of new friends. September 23 & 24, 2000 ~ Annual Plow and Hearth Outlet Tent Sale Another beautiful weekend. The dogs were on their best behavior, and met lots of wonderful people. September 30, 2000 ~ Charlottesville Vegetarian Festival (sponsored by Voices for Animals) This was the fourth annual event, and it gets better each year. The food was great, the people were wonderful, and the critters were adorable.